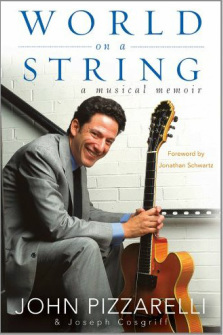 World on a String by John Pizzarelli with Joe Cosgriff - Doug Grad Literary Agency, Inc.
John Pizzarelli is not just a great musician, he’s a true raconteur with the eye for detail and ear for remembering dialogue that’s every bit as good as his ear for picking up chord changes on an unfamiliar tune. World on a String is sheer enjoyment—a book you'll want to read again as soon as you finish. "John Pizzarelli has the gift of gab in more ways than one. A great storyteller, he can spin the tiniest anecdote about the musician's life into a sidesplitting absurdist yarn." "They say great musicians should play, not talk: John Pizzarelli is the exception. His book is as breezy, melodic and lyrical as one of his concerts, and he captures both the love and laughter of a life in music with virtuoso skill." "John Pizzarelli is one of the most entertaining performers you'll ever see on a stage. He's perfection: a musician, a singer, a comedian. And now with World on a String, it turns out that John's a perfection author, too. You're going to love it." "World on a String is engaging, well written, heartfelt, and insightful. I'm impressed by John's recall and by the way he can recreate a moment and convey a warm sense of all these characters." "I found myself erupting in laughter at least a dozen times. Not what you expect from an autobiography of a guitar player, or an autobiography of just about anyone except Groucho Marx." Joseph Cosgriff’s magazine articles have been adapted and reprinted in the Boston Globe, Los Angeles Times, and Newsweek. John Pizzarelli, Cynthia Crane, and Bobby Bryne (and some others on YouTube) are among those who have performed or recorded his music, songs that have been performed at Carnegie Hall, the PNC Arts Center, the Blue Note in Japan, and various concert halls throughout the world. The New Jersey State Assembly nominated his song, “I Like Jersey Best,” for Official New Jersey State Jingle. Without music, he has written (and ghostwritten, with confidentiality agreements) the liner notes to numerous jazz CDs. As Vice President of the BLOHARDS (Benevolent and Loyal Order of Honorable and Ancient Red Sox Diehard Sufferers), Mr. Cosgriff writes the website, the Facebook page, the Twitter page, and the blog for this affiliation of Red Sox fans who live in New York City. He writes the material for the club’s 250-guest luncheons, which he co-hosts with Mr. Pizzarelli. These luncheons have been covered by WNBC, WABC, the New York Times, the New York Post, the Boston Globe, New York 1, NESN, WFAN, and the Daily News. Joseph Cosgriff lives in New York City.